How to apply for TSPSC Gurukulam Teaching, Non Teaching posts recruitment 2017: Online , How to apply for TS Gurukulam Posts, how to fill gurukulam application, How to apply for TSPSC Gurukulam Teachers,Non Teaching posts recruitment 2017. 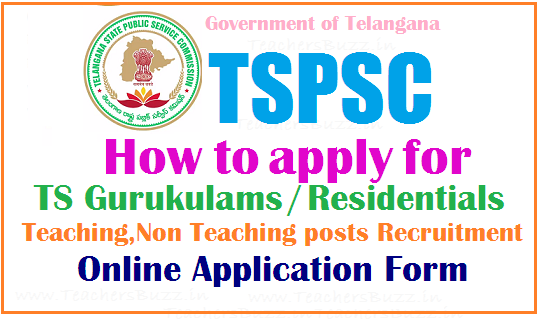 Online applying procedure for TS Residential School Teachers Recruitment, Step by step process to apply for TSPSC Residential Teachers Recruitment, Online application form filling instructions. Telangana State Public Service Commission (TSPSC) has published a recruitment notification for 7,306 Gurukulam Teaching non teaching posts vacancies under Residential Educational Institutions Societies on 13/04/2017. TSPSC Gurukulam Teaching Non Teaching Posts Recruitment TGT Teacher, PGT Teacher, PET Teacher, PD Teacher Librarian, Staff Nurse, Music Teacher, Art Teacher, Craft Teacher posts would be filled in TREIS, TSWREIS, TTWREIS, TMREIS, MJPTBCWREIS Residential Schools for this year. For these posts Online applications will be accepted. Online Application submission procedure given here. OTR application if not registered earlier to obtain TSPSC ID. While filling the same, the candidates have to ensure that there are no mistakes in it. The Commission bears no responsibility for the mistakes, if any, made by the candidates. modes of payment online. Separate instructions have to be followed for each mode of payment. particulars furnished by the candidates. The ID No in the PDF Application form has to be quoted for future reference/correspondence. later date will not be considered for the purpose of this Notification. 1. The Commission is not responsible, for any discrepancy in Bio-data particulars while submitting the application form through Online. The applicants are therefore, advised to strictly follow the instructions and User guide in their own interest before submitting the application. 2. The particulars furnished by the applicant in the Application Form will be taken as final, and data entry is processed, based on these particulars only by Computer. 3. Incomplete/incorrect application form will be summarily rejected. The information if any furnished by the candidate subsequently in any form will not be entertained by the Commission under any circumstances. Applicants should be careful in filling-up the application form and submission. If any lapse is detected during the scrutiny, the candidature will be rejected even though he/she comes through the final stage of recruitment process or even at a later stage. compulsorily be kept with the applicants to produce as and when required to do so. Failure to produce the required certificates on the day of verification will lead to disqualification. technical qualifications, experience and community are accepted only provisionally on the information furnished by them in their application form and is subject to verification and satisfaction of the Commission. Mere admission to any test or interview or inclusion of the name of a candidate in a Merit List will not confer on the candidate any right for appointment. The candidature is therefore, provisional at all stages and the Commission reserve the right to reject candidature at any stage of the selection even after the advice has been made. 7. This Recruitment is entrusted to TSPSC along with Finance Clearance vide G.O. Ms.
vi). Local Scheduled Area Certificate (Candidates hailing from Agency Area) wherever applicable. vii). Pass certificate in TET Part-II conducted by the State Government. ix). Non-Creamy Layer Certificate as per Form- VIIB / Creamy Layer Certificate as per Form- VIIC. The following Certificates (whichever is applicable) should be obtained from Competent Medical authority for the purpose of verification. c) Medical Certificate in respect of Orthopedically Handicapped Candidates.